Two week ago, I had an early start for a number of meetings in Waterford. I afforded myself the luxury of a slow-ish spin home and some stops for discovering and learning – there are always new plaques and signs to be read. The leisurely speed presented the opportunity to spot a plaque in the grounds of a GAA Club through the fields. I went exploring and learnt. I had known that in the early years of inter-county G.A.A. matches, the county was represented by a Club – effectively similar to the All-Ireland Club Championship as is now. This had been filed away in my knowledge bank with Kildare’s white jerseys being first worn by Clane who represented Kildare in their first inter-county match. I did not know that the first round of inter-county matches was held in 1887, 130 years ago, on this day. Ballyduff Lower represented Waterford and this plaque was erected to record the event. ​I was somewhat surprised at the listing of 33 names but assumed that it related to all players who played in the county championship as well as the inter-county. The entrance gate to the club was being painted at the time when I visited. I have no doubt that the painter was a volunteer club member. It was he who educated that teams had 21 players a side in 1887. He also said that in 1987, there was 21-a-side match between Ballyduff and Young Irelands to commemorate and record the first inter-county match. Interesting asides from the 1887 football championship include that Kilkenny beat Cork; and, that Commercials of Limerick were the inaugural winners. I now have another prompt not to forget my wedding anniversary. The first Olympic Medal ever presented in Ireland. A few years back, homebound with a cold, I caught up on a number of radio documentaries from DocOnOne, including ‘A Convict Of The Road’. I had read briefly prior to that of the race but this was the first that I really learnt of Mick Murphy. Last year, I was again reminded on Mick Murphy when I stopped opposite the Black Shop Bar to look at these commemorative plaques. I was reminded once again of Mick Murphy. On Friday, I was on the 05.55 train to Dublin, checking Twitter, when I read of the death of Mick Murphy. Today, I listened again to ‘A Convict Of The Road’, a memory of times well past. It would be forty minutes well spent if you are tempted. We were in Doonbeg over the Easter weekend and walked out to Tra Bán / White Strand. There, just above the beach, is the monument to Pat McDonnell from Killard. Returning home, I found my copy of ‘Irish Athletes & The Olympic Games, Stockholm 1912’ and searched the web. I now know a bit more about the Olympic champion, World Record holder and winner of twenty-four American National Championships – the last at 54 years of age. The family emigrated in 1899. His sister was first in the queue at Ellis Island and the Immigration Officer heard ‘McDonald’ when she said ‘McDonnell’ so the name of the whole family changed. He joined the New York Police Department as Pat McDonald. Interesting to note that the plaque at Tra Bán has the original name. He weighed 300lbs – 21 st 6lb – which led to the nickname ‘Babe’ from ‘Baby Whale’. He was one of ‘The Irish Whales’. He was one of many Irish emigrants to win Olympic medals for other countries. He carried the U.S. A. flag at the 1920 Olympics – winning a gold medal to add to the gold and silver from 1912. The 1916 Olympics had been cancelled due to World War I. Eaten Bread and all that….. The team may like to reference its tradition and the history of previous matches and campaigns – but a sponsor may be treated differently. A sponsor can gain from being associated with a team, but there does not appear to be any past – just a present and a future. Toyota were the main sponsors of Munster Rugby from Summer 2004 to Summer 2013 – during which period, it was reported that they invested €13m. In 2013, SEAT became Car Partners to Munster Rugby. Within months of the end of the Toyota sponsorship, it was as if they were never there with Munster staff were changing to driving SEAT cars. When I saw this on the Bank of Ireland premises at 32, South Mall, I got to thinking about the difficulties of being associated with a professional sports team. The Marketing Dept probably spent some time deciding on the message to be conveyed and the actual wording to accompany the image. To my reading, Bank of Ireland were linking into the group spirit and being at one with the team – ‘We’re with you every step of the way’. All that appears fine until half way through the year, the player featured shows his determination and decides to step away and join another team. So are Bank of Ireland I step with J.J. in thinking it best to leave here….. If the Marketing Dept knew then what they know now, would the message and image be together? Today I was in Liam Ruisèal Teo and purchased a book by Colm Murphy, Irish Athletes & The Olympic Games, Stockholm 1912. 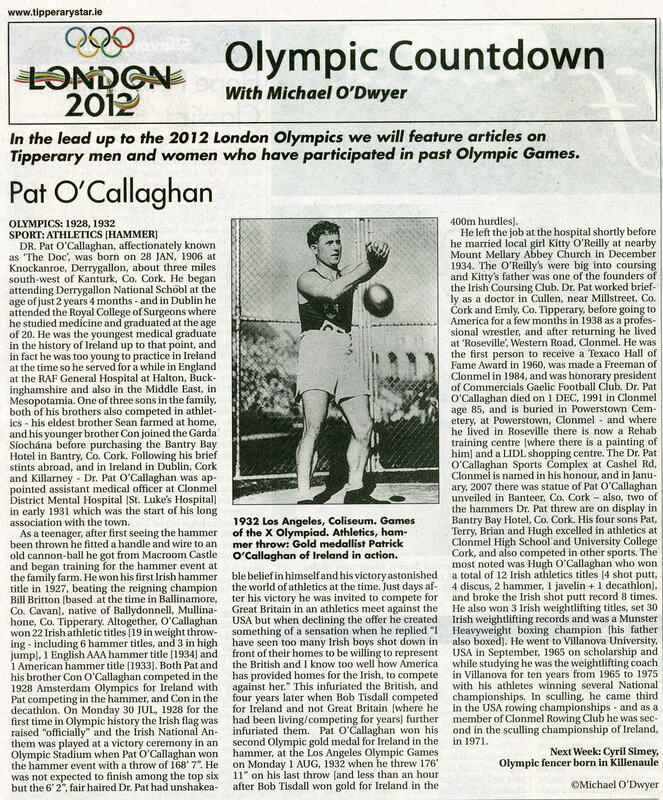 It profiles 46 men who participated in the 1912 Games. I was flicking through this afternoon and was reading about Timothy ‘Tim’ Leahy who is described as ‘the last of the brothers’. He was from Cregane, Co.Limerick and went to school at Charleville C.B.S. – where Éamon deValera was also a pupil. He had the highest jump in 1910. I am unsure as to why he is included in the book as the book does not state that he participated in the 1912 Olympics which appears to be confirmed by the Athletics Ireland website. I was very well aware of this plaque from many years of passing the building but it was only in July that I stopped to photograph. My instant thought was that it was another for the sports collection – Dr. Pat O’Callaghan, Denis Horgan, Dan O’Leary and Steve Casey all justifying a daily blog comment earlier in the summer following on from the likes of John C Lordan and Jack Doyle. There has been a delay while I have read (most of) a book on T. C. Murray as the web provided contradictory information with regard to an Olympic Medal – which was for literature and not for sport. Please expect some more plaques to sports people for times past in the near future. I have added to my mental To Do list further research as to the 1924 Olympics – was the “‘literary competition ‘for men of letters’ associated with the 1924 Olympic Games” the same as the “Art competitions at the 1924 Olympics in Paris” or were they different competitions; and who were the prize-winners. I suspect that this item may remain on the list for a good while. “In Cork city he co-founded the Cork Little Theatre Company with other authors such as the famed Daniel Corkery and Con O’Leary and the heroic Lord Mayor of Cork, Terence McSweeney, who died on hunger strike at Brixton Prison, England in 1920. The group became known as The Cork Realists. The validity of the saying that goals win matches was reinforced with Kerry coming back more than once last weekend in the semi-final against Kerry. The match brought to mind this photograph taken a while back in Killorglin – or more correctly, the poem was remembered. The previous Tuesday required a trip to Dublin. I had planned to do a bit of work on the train but in my rush to the station, my laptop never made it into the bag. Paperwork was completed by Mallow so out came ‘Rain on the Wind’ and I had hopes for enjoyable me-time. A couple from the Kerry train got on at Mallow. They sat opposite the aisle from my four-seater table. They sat next to each other opposite a man who had been on his own and silent since Cork. The three then proceeded to talk with less stops than the train all the way to Dublin. My inability to cut out background noise and concentrate on the task at hand was reinforced. My admiration for conversation, a skill that is losing out to the internet age, was very much outweighed by silent cursing at the inability to progress with the book. Mico could not compete with the conversation. My hopes for an improvement on the return journey and escape to the imagery in the book did not even last as long as the lottery draw. The three generations at the table opposite chatted most of the way to Thurles – either among themselves or, even louder, on a mobile. Are there many things more annoying hearing the same thing three or more times, among themselves and then shared more than once, on the phone? A friend of the girl opposite me stopped his walk up the carriageway and then they also proceeded to dispel the notion as to the decline of conversation. The book remained on the table. I overheard that she has travelled from Kerry to Portlaoise that morning but had to spend an hour at Mallow as not all Cork Dublin trains stop at Portlaoise. I reckon I had trumped that experience last December with an hour at Limerick Junction – something that may have been experienced by any Kerry supporter leaving Limerick to connect with the 20.00 Dublin Cork ghost train. Both were going as far as Killarney. Road transport was then in order for the rest of trip home, she to Portmagee and he Caherciveen. Having only travelled the route some weeks back, I was picturing their journey out to Killorglin, over the bridge and then onwards along the Iveragh Peninsula. My journey of recall , as the actual one, and as this rambling thought stopped at the old railway sign in Killorglin. I had not heard of him two months ago but it looks like Sigerson Clifford is somewhat akin to tyre punctures – coming in threes. With the shouldering, and shouting, and the din. And a brew beagawneen stronger for the men. Beyond by Foxy Jack’s place I could hear a shepherd bark. I did mention that there was likely to be a few blogs on sporting memorials – even since then, I have noted some more. Last week, I was introduced to Steve ‘Crusher’ Casey in Sneem – one of the Strongest Family on Earth. I have added ‘The Legendary Casey Brothers’ to my list of books to look for. Other than the titles and victories, it is not a bad epitaph that Joe Louis declined a fight. Maybe it is the mental image of early morning rowers emerging from the haze on a lake but there is something magnetic in the grace of rowing – so much opposite what one imagines of wrestling. So it is a bit surprising that a World Champion Wrestler has me thinking of early morning rowing. I can almost see in a film the rowing competitions in Newport with the many spectators. I remember twenty or more years ago watching Cork Regatta down the Marina and being told of the huge crowds that would have attended many years previously. I have a vague recollection that the main prize is the Leander Trophy and if there is any risk of any club winning the cup three times in a row, that the Leander Club in London will send over a squad to try to prevent such a happening. A while back, reading Andy Ripley’s biography, Ripley’s World, I was almost tempted to try rowing for the freedom of gliding over water – an attraction that wrestling never posed. Neither have been tried - to date. “Both parents worked for the Vanderbilt family at their summer estate in Newport, Rhode Island, during their younger days. Mike Casey oversaw the employment and operation of the extensive fleet of racing sculls maintained by the millionaire family, particularly during the Newport Regatta each summer. Yet another village visited recently – Rathbarry. Rob Heffernan is not the only champion walker. Dan O’Leary had that honour many years previously and probably earned a lot more relatively. A very interesting life and story has been learnt of through the web. Another village that I visited for the first time recently – Lyre. Another sportsman commemorated – this time one that was new to me – Denis Horgan. The statistic in the Examiner article, I found amazing. What a success rate in three Olympics. “ In the next 84 years Irish competitors would win only four medals in track and field events. On my travels recently, I have noticed that there are quite a number of plaques and monuments to sportspeople – some I have heard of but many more that I have not. There have been a few blogs previously on some such plaques but you are hereby warned that you will likely see a good few more in the coming weeks. My first ever visit to Banteer was only recently and there I spotted this statue to Dr. Pat O’Callaghan. I had known the regular table quiz question that he won the first Olympic Gold Medal for Ireland but the statue has prompted some web research which has taught me that he was offered the role of tarzan and that a child died as a result of being hit by a flying hammer; that Adolf Hitler arranged for his technique to be videoed; and that two hammers are on display in the Bantry Bay Hotel.